Charlotte Digges Moon was born in 1840 to a wealthy and elite family of Albemarle county Virginia. She was born third in a family that would eventually come to have seven children. Her childhood home was the Viewmont estate, a tobacco plantation within proximity to three presidential estates, Monticello, Montpelier, and Ashlawn. Lottie’s maternal uncle had once purchased the Monticello estate, former home of Thomas Jefferson, in order to preserve it. The Moon household thrived on income from its vast land holdings that had been accumulated and developed since the middle of the eighteenth century. Lottie’s father was estimated to have had land holdings in the neighborhood of fifteen-hundred acres. As a plantation in the pre-Civil War era, many of their cash crops like tobacco were processed by slave labor. Other denominational issues would also plague the Moon household. Lottie’s maternal uncle, James Barclay warned Lottie’s mother and grandmother to stay away from revival services that came to nearby Scottsdale because of their Campbellite leanings. However, he later attended the services along with his wife and they found themselves joining with a new denomination called the “Disciples.” He would become an elder and builder of the church in Scottsdale. He would also serve as the Disicples first missionary. Edward moon was cured of his sickness and in 1852 set off on a journey to buy cotton in New Orleans. On the way, however, the steamer caught fire forcing the passengers to flee. Edwards stayed behind struggling to pull a large piece of leather luggage that contained the funds he needed to make his purchases. In the middle of his struggle he was struck with what is assumed to be a heart attack or stroke and died shortly thereafter on the bank of the Mississippi. The date was January 26, 1853 and young Lottie Moon “entered the critical teen years” without a father. Una R. Lawrence. 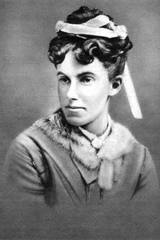 Lottie Moon. (Nashville, Tenn.: Sunday School Board of the SBC, 1927),24-25. Tucker, Ruth. From Jerusalem to Irian Jaya: a Biographical History of Christian Missions. (Grand Rapids, Mich.: Zondervan, 1983), 234. Albert Mohler. “Forum on the Life and Legacy of Lottie Moon.” Lecture, Great Commission Week from Southern Baptist Theological Seminary, Louisville, KY, October 21, 2009. Jerry Rankin and Don Rutledge. A Journey of Faith and Sacrifice: Retracing the Steps of Lottie Moon. (Birmingham, Ala.: New Hope, 1996), 25. Sullivan, Chapter 1, Location 259. Kindle Electronic Edition. Tom Nettles. “Lottie Moon Biography.” Lecture, from The Gospel Coalition. January 1, 2000. Catherine B Allen. The New Lottie Moon story. 2nd ed. (Birmingham, Ala.: Woman’s Missionary Union, 1997), 20. Sullivan, Chapter 1, Location 519-524. Kindle Electronic Edition. Allen. The New Lottie Moon Story, 20-21. Allen. The New Lottie Moon Story, 23. I want to read MORE! Glad you are doing this every day so I don’t have to wait too long. THANKS!